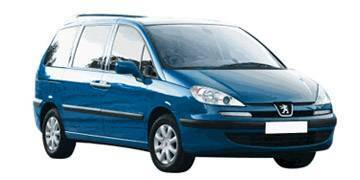 Read our helpful guide to second hand Peugeot 807. AA Cars works closely with thousands of UK used car dealers to bring you one of the largest selections of Peugeot 807 cars on the market. You can also browse Peugeot dealers to find a second hand car close to you today. All used Peugeot 807 on the AA Cars website come with free 12 months breakdown cover. Produced alongside its French and Italian partners, the Peugeot 807 shares much of its engineering (it differs in looks) with the Citroen C8 and the Fiat Ulysee, and is the successor to the less-popular 806. A large MPV with a practical and large cabin that fits in seven adjustable seats, the family car (or taxi) capabilities of the 807 are impressive. So too is its boot space, which at a possible 2948 litres, decidedly cavernous. On the road it isn?t quite as able, but its diesel options (either 2.0 or 2.2 litre) are far better than their petrol counterparts. With a full cabin however, it does struggle. Being refined and comfortable though, on long distances it copes well, and so despite its utilitarian leanings, it is a competent and affordable family wagon.